In 2012, Public Education Network (PEN) closed its doors after 21 years. PEN was a network of local education funds (LEFs) -- community based organizations in high poverty school districts across the United States -- that continue to work with their school districts and communities to improve public education for the nation's most disadvantaged children. At the national level, PEN raised the importance of public engagement as an essential component of education reform. It brought the voice of LEFs and the communities they represent into the national education debate. 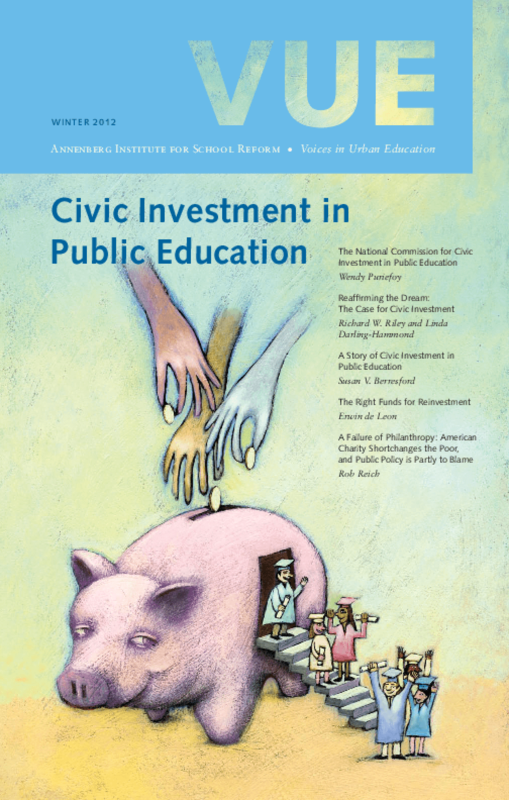 Finally, PEN gave voice to the essential nature of the connection between quality public education and a healthy and thriving democracy. 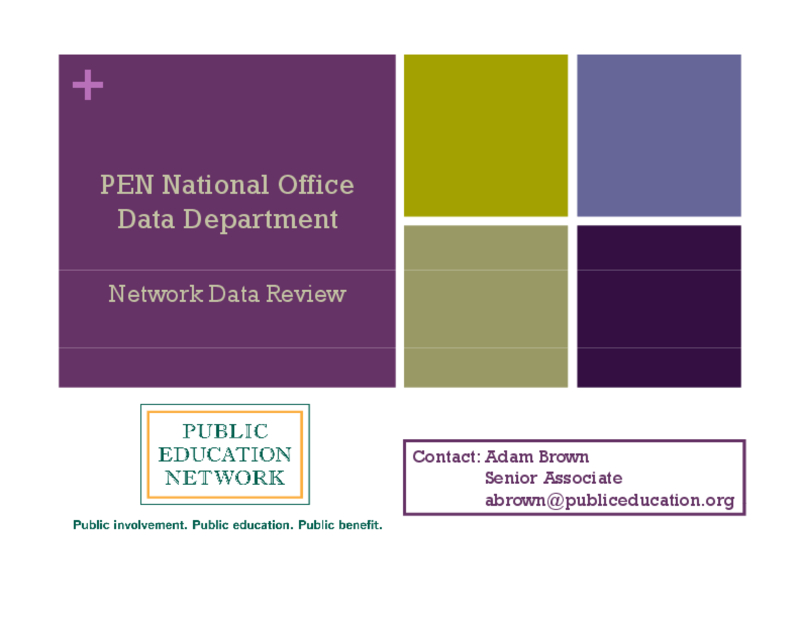 The most recent directory of Public Education Network (PEN) members nationwide. The list includes contact information for 75 member organizations. 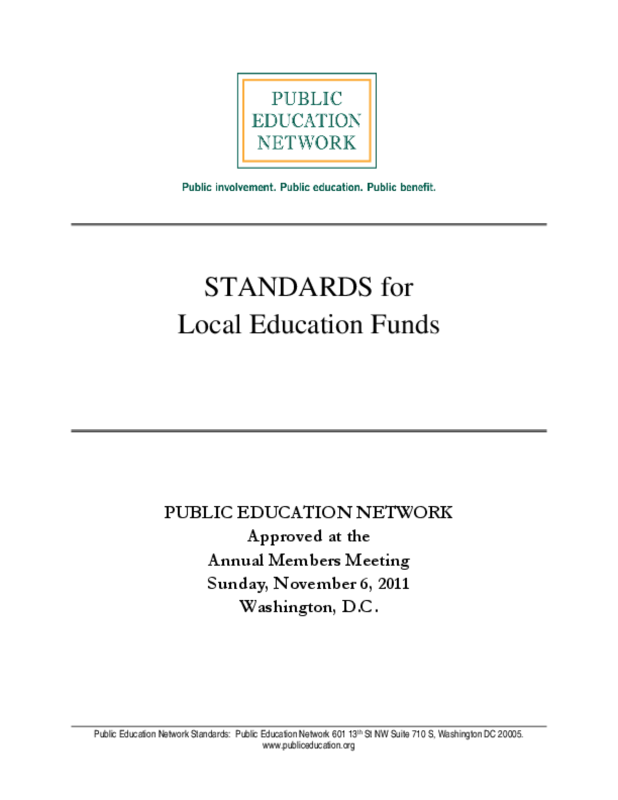 The following standards have been adopted by Public Education Network (PEN). 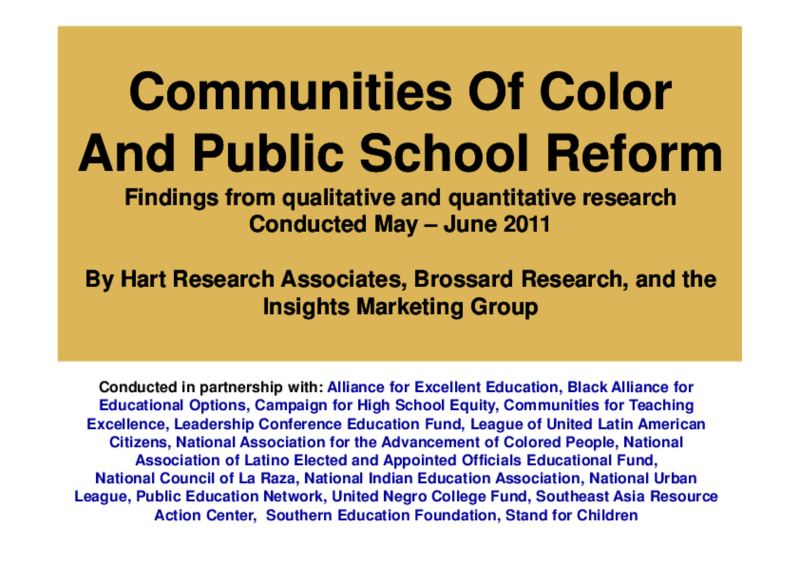 They were first developed and recommended for use by education support organizations by the National Commission on Civic Investment in Public Education (2011), which had adapted standards contained in the Independent Sector's Statement of Values and Code of Ethics for Nonprofit and Philanthropic Organizations (2004). PEN's Membership Committee, with suggestions from a broad range of local education funds, tailored the Commission's standards to more closely align with the work of Local Education Funds. 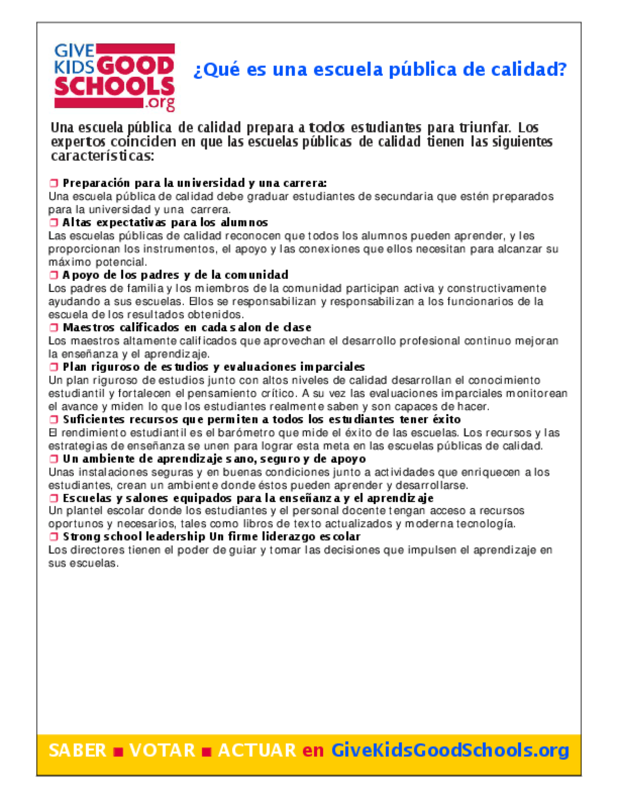 Qué es una escuela pública de calidad? Una escuela pública de calidad prepara a todos estudiantes para triunfar. Los expertos coinciden en que las escuelas públicas de calidad tienen las siguientes características. Elected officials at every level have a responsibility to ensure that all children have quality public schools that prepare them for college and a career. In turn, individuals have a powerful role when it comes to electing candidates and passing measures that support quality public education. As citizens, we have the ability to set high expectations for public education, elect school board members, pay taxes to support public schools, vote for school bond referenda and elect public officials who fulfill campaign promises. 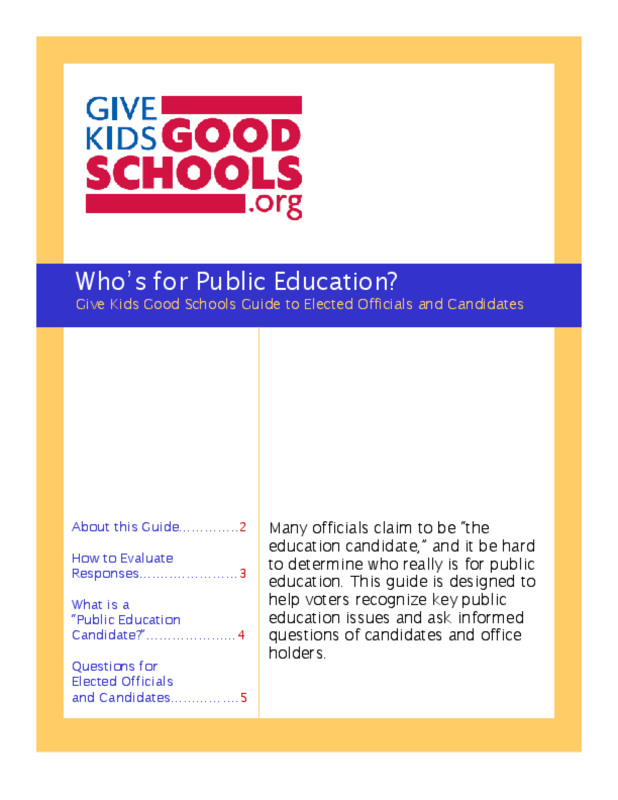 This guide is written for everyone who wants to know how to recognize questions and issues that impact quality public education and is designed to help you ask informed questions of candidates and office holders. 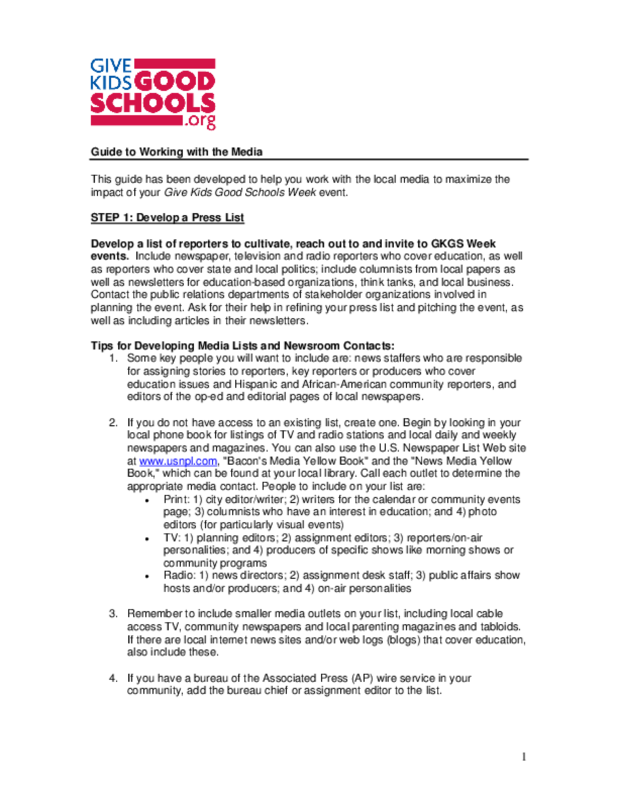 A guide developed to help users work with local media to maximize the impact of Give Kids Good Schools Week events.